Brains beat brawn in the opening Classic of 2012, with Simon Gerrans outsprinting Fabian Cancellara at the end of an absorbing race. Cycle Sport looks at how he did it. Nobody said cycling was logical. The strongest rider at Milan-San Remo was Fabian Cancellara. The strongest team, Liquigas. But with Simon Gerrans’ well-executed victory in Milan-San Remo we were reminded what potent weapons clever tactics, patience, a bit of bluff and a cool head are. 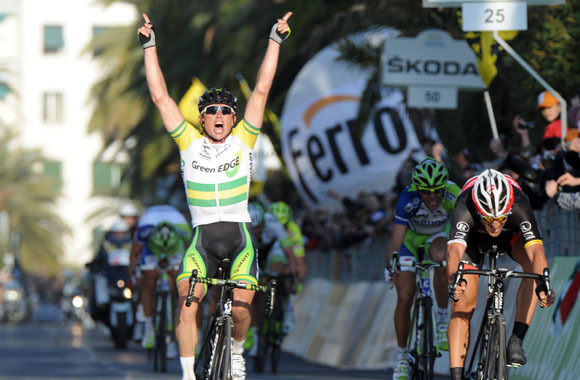 Gerrans easily outsprinted Cancellara in San Remo, becoming the second consecutive Australian winner of La Primavera after Matt Goss, having been given virtually a free ride through the final kilometres in Cancellara’s wake. Gerrans had neither the legs nor any particular reason to contribute to the pacemaking down the Poggio and into the town, gambling that Cancellara’s pride would lead the Swiss into a trap. It worked. The victims of Cancellara’s strength used to be his rivals. In the last couple of Classics campaigns, since his incredible 2010 wins in Flanders and Roubaix, the biggest victim of Cancellara’s strength has been Cancellara himself. His physical superiority is such that nobody dares match him, much less help him. Far better to sit on his wheel, quench his fire, and use his strength against him. The only way to counter the tactics of shock and awe is to use guerrilla warfare. Gerrans played the race perfectly. He countered Vincenzo Nibali’s attack on the Poggio, an event so predictable that the Liquigas team director might just as well have been leaning out of the team car window with a loudhailer, telling the Italian to go. The pair were joined by Cancellara, and over the top of the climb, barely clear of a strung-out chase group containing some extremely strong sprinters, they hared down into San Remo. Their order all the way down, and most of the way through the town, was Cancellara, Gerrans then Nibali. Nibali stayed in third all the way in, but for Gerrans, a better and fresher sprinter than Cancellara, the final act of the race was a formality. Cancellara wasn’t the only victim of his reputation in the 2012 Milan-San Remo. The first big favourite to lose the race was Mark Cavendish, as dominant in the sprints as Cancellara has been in the flat Classics, who was put into trouble by the fast pace on the Manie climb with 100 kilometres to go. The Brit looked laboured as he was dropped on the steep gradients. This was no tactical conservation of effort – he was visibly in trouble, all over his bike, and all over the television coverage. His rivals rightly took advantage of the opportunity to put him out of the race. The Manie climb, since its addition in 2008, has had a huge effect on the race. Last year, crashes on the descent irrevocably split the bunch, while this year it killed Cavendish’s dream of winning San Remo in the rainbow jersey. In an unequal pursuit match, four Sky riders tried to close the minute-long gap to the bunch along the fast coast roads. It was like trying to chase a 150-man team time trial team, and though they closed, painfully, to 40 seconds, by the time the bunch hit the three Capi in the run-up to the Cipressa, Cavendish had given up. Mission accomplished. But having worked so hard to get shot of the best sprinter in the race, the bunch seemed unsure of what to do next. Once Cavendish had capitulated, there was a strange truce over the capi and Cipressa, broken only by a televisual and doomed attack by Johnny Hoogerland, whose speciality seems to be televisual and doomed attacks. BMC, Liquigas and Omega Pharma-Quick Step had been the architects of Cavendish’s downfall, setting that searing pace along the coast, although tactically, BMC weren’t really benefitting from the Brit’s absence. BMC’s plan would have been based around Philippe Gilbert, Greg Van Avermaet or Alessandro Ballan. None of these riders are sprinters, so while Cavendish being dropped did mean one less rival, BMC still had Freire, Boonen, Degenkolb and any number of rapid finishers still to deal with, only they had already tired out their domestiques. Gilbert knew it, and he rode to the head of the bunch to admonish his team-mates, pulling them off the front. Unfortunately for Gilbert, he crashed on the Cipressa, putting himself out of contention. Liquigas looked like the team most confident in their plan, which was for Nibali to inflict some damage up and over the Poggio, and for Peter Sagan to do the same in the sprint. They kept the bunch together to the Poggio, then Valerio Agnoli executed part one of their plan, attacking early on the climb. He was countered by Angel Madrazo of Movistar, who kept Agnoli company until the one important attack of the entire race, on the long straight drag two thirds of the way up, by Vincenzo Nibali. Rabobank, with Mark Renshaw and Matti Breschel still in contention, had led the pursuit of Agnoli. Once he’d been closed down, Nibali went. Gerrans’ reaction was so quick, it was as if the two had co-ordinated their pedal strokes. Cancellara pulled himself up to the leading pair, and the gap slowly grew. This is the precise moment Liquigas lost the race. The plan was indeed for Nibali to get away on the Poggio. He succeeded in that, but Nibali needed to be alone over the top. In going away with a superior sprinter, Simon Gerrans, and a superior rouleur, Fabian Cancellara, Nibali had signed his own death warrant. Behind, Nibali’s team-mate Peter Sagan had been put in a box, forced to sit back as Katusha led the chase. Two thirds of the leading trio had ridden themselves into a tactical corner, despite their superior strength. Cancellara was being driven by pride to keep the break going while Nibali was in the wrong place. He sat on the back as Cancellara increased the leaders’ advantage from four seconds at the top of the descent to a dozen seconds at the bottom. He was going to come third of three at best, reduced to the role of spectator, when Sagan needed his help. Gerrans knew that all he had to do was keep a cool head, sit on Cancellara, wait for the finishing straight and hope that the group behind wasn’t closing too fast. He could have made the success of the escape more certain by doing a turn or two, but he gambled that Cancellara was doing enough, and calculated that he had one chance to win: wait. If he’d done more turns, he risked wasting energy, or leading the sprint out and being beaten. The smartest guy in the race was about to win Milan-San Remo. Behind Gerrans, Peter Sagan sprinted to fourth place just two seconds later. Just one turn from Nibali, if he’d been with Sagan, might have made the difference. Over the 300 kilometres Liquigas were aggressive, they took responsibility for the race and, until things went wrong on the Poggio, they were well-drilled. But they blew it. So did Cancellara. This time, the strongest riders were beaten by the cleverest.